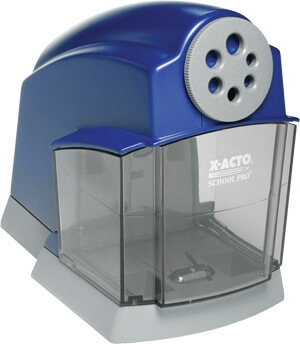 Introducing the first electric pencil sharpener specifically designed for classroom use. Features quiet operation for less classroom disruption, heavy duty motor and extra-durable outer case. Safe-Start will not operate if receptacle is not closed. Has Auto-Reset motor shut-off, automatic pencil stop and non-skid feet for safety. Also features multiple size dial and extra-large see-through receptacle.